Following early reports of bleaching in the area, researchers from three Australian universities and two government agencies have worked together throughout March to investigate and document the bleaching. Sustained heat stress has seen 90% of some reefs bleached, although other parts of the marine park have escaped largely unscathed. Lord Howe Island was named a UNESCO World Heritage site in 1982. It is the coral reef closest to a pole, and contains many species found nowhere else in the world. Two of us (Tess Moriarty and Rosie Steinberg) have surveyed reefs across Lord Howe Island Marine Park to determine the extent of bleaching in the populations of hard coral, soft coral, and anemones. This research found severe bleaching on the inshore lagoon reefs, where up to 95% of corals are showing signs of extensive bleaching. However, bleaching is highly variable across Lord Howe Island. Some areas within the Lord Howe Island lagoon coral reef are not showing signs of bleaching and have remained healthy and vibrant throughout the summer. There are also corals on the outer reef and at deeper reef sites that have remained healthy, with minimal or no bleaching. One surveyed reef location in Lord Howe Island Marine Park is severely impacted, with more than 90% of corals bleached; at the next most affected reef site roughly 50% of corals are bleached, and the remaining sites are less than 30% bleached. At least three sites have less than 5% bleached corals. Over the past week heat stress has continued in this area, and return visits to these sites revealed that the coral condition has worsened. There is evidence that some corals are now dying on the most severely affected reefs. Forecasts for the coming week indicate that water temperatures are likely to cool below the bleaching threshold, which will hopefully provide timely relief for corals in this valuable reef ecosystem. In the coming days, weeks and months we will continue to monitor the affected reefs and determine the impact of this event to the reef system, and investigate coral recovery. The bleaching was caused by high seawater temperature from a persistent summer marine heatwave off southeastern Australia. Temperature in January was a full degree Celsius warmer than usual, and from the end of January to mid-February temperatures remained above the local bleaching threshold. Sustained heat stressed the Lord Howe Island reefs, and put them at risk. They had a temporary reprieve with cooler temperatures in late February, but by March another increase put the ocean temperature well above safe levels. This is now the third recorded bleaching event to have occurred on this remote reef system. However, this heatwave has not equally affected the whole reef system. In parts of the lagoon areas the water can be cooler, due to factors like ocean currents and fresh groundwater intrusion, protecting some areas from bleaching. Some coral varieties are also more heat-resistant, and a particular reef that has been exposed to high temperatures in the past may better cope with the current conditions. For a complex variety of reasons, the bleaching is unevenly affecting the whole marine park. Coral bleaching is the greatest threat to the sustainability of coral reefs worldwide and is now clearly one of the greatest challenges we face in responding to the impact of global climate change. UNESCO World Heritage regions, such as the Lord Howe Island Group, require urgent action to address the cause and impact of a changing climate, coupled with continued management to ensure these systems remain intact for future generations. The authors thank ProDive Lord Howe Island and Lord Howe Island Environmental Tours for assistance during fieldwork. Shark Bay was hit by a brutal marine heatwave in 2011. Stromatolites are a living window to the past. Solenosmilia coral reef with unidentified solitary yellow corals. Off southern Tasmania, at depths between 700 and 1,500 metres, more than 100 undersea mountains provide rocky pedestals for deep-sea coral reefs. Unlike shallow tropical corals, deep-sea corals live in a cold environment without sunlight or symbiotic algae. They feed on tiny organisms filtered from passing currents, and protect an assortment of other animals in their intricate structures. Deep-sea corals are fragile and slow-growing, and vulnerable to human activities such as fishing, mining and climate-related changes in ocean temperatures and acidity. This week we returned from a month-long research voyage on CSIRO vessel Investigator, part of Australia’s Marine National Facility. We criss-crossed many seamounts in and near the Huon and Tasman Fracture marine parks, which are home to both pristine and previously fished coral reefs. These two parks are part of a larger network of Australian Marine Parks that surround Australia’s coastline and protect our offshore marine environment. The RV Investigator criss-crossed the Huon and Tasman Fracture marine parks. The data we collected will answer our two key research questions: what grows where in these environments, and are corals regrowing after more than 20 years of protection? Conducting research in rugged, remote deep-sea environments is expensive and technically challenging. It’s been a test of patience and ingenuity for the 40 ecologists, technicians and marine park managers on board, and the crew who provide electronics, computing and mechanical support. But now, after four weeks of working around-the-clock shifts, we’re back in the port of Hobart. We have completed 147 transects covering more 200 kilometres in length and amassed more than 60,000 stereo images and some 300 hours of video for analysis. The deep tow camera system weighs 350 kilos and has four cameras, four lights and a control unit encased in high-strength aluminium housings. A deep-tow camera system designed and built by CSIRO was our eye on the seafloor. This 350 kilogram system has four cameras, four lights and a control unit encased in high-strength aluminium housings. An operations planner plots “flight-paths” down the seamounts, adding a one-kilometre run up for the vessel skipper to land the camera on each peak. The skipper navigates swell, wind and current to ensure a steady course for each one-hour transect. An armoured fibre optic tow cable relays high-quality, real-time video back to the ship. This enables the camera “pilot” in the operations room to manoeuvre the camera system using a small joystick, and keep the view in focus, a mere two metres off the seafloor. This is an often challenging job, as obstacles like large boulders or sheer rock walls loom out of the darkness with little warning. The greatest rapid ascent, a near-vertical cliff 45m in height, resulted in highly elevated blood pressure and one broken camera light! Live imagery from the camera system was compelling. As well as the main reef-building stony coral Solenosmilia variabilis, we saw hundreds of other animals including feathery solitary soft corals, tulip-shaped glass sponges and crinoids. Their colours ranged from delicate creams and pinks to striking purples, bright yellows and golds. To understand the make-up of coral communities glimpsed by our cameras, we also used a small net to sample the seafloor animals for identification. For several of the museum taxonomists onboard, this was their first contact with coral and mollusc species they had known, and even named, only from preserved specimens. A deepwater hippolytid shrimp with large hooked claw, which it uses to clean coral and get food. We found a raft of undescribed species, as expected in such remote environments. In many cases this is likely to be the only time these species are ever collected. We also found animals living among the corals, hinting at their complex interdependencies. This included brittlestars curled around corals, polychaete worms tunnelling inside corals, and corals growing on shells. We used an oceanographic profiler to sample the chemical properties of the water to 2,000m. Although further analysis is required, our aim here is to see whether long-term climate change is impacting the living conditions at these depths. A curious feature of one of the southern seamounts is that it hosts the world’s only known aggregation of deep-water eels. We have sampled these eels twice before and were keen to learn more about this rare phenomenon. Using an electric big-game fishing rig we landed two egg-laden female eels from a depth of 1,100 metres: a possible first for the record books. Dave Logan of Parks Australia with an eel landed from more than a kilometre under the sea. In a side-project, a team of observers recorded 42 seabird species and eight whale and dolphin species. They have one more set of data towards completing the first circum-Australia survey of marine birds and mammals. An important finding was that living S. variabilis reefs extended between the seamounts on raised ridges down to about 1,450m. This means there is more of this important coral matrix in the Huon and Tasman Fracture marine parks than we previously realised. In areas that were revisited to assess the regrowth of corals after two decades of protection from fishing, we saw no evidence that the coral communities are recovering. But there were signs that some individual species of corals, featherstars and urchins have re-established a foothold. In coming months we will work through a sub-sample of our deep-sea image library to identify the number and type of organisms in certain areas. This will give us a clear, quantitative picture of where and at what depth different species and communities live in these marine parks, and a foundation for predicting their likely occurrence both in Australia and around the world. The seamount corals survey involved 10 organisations: CSIRO, the National Environmental Science Program Marine Biodiversity Hub, Australian Museum, Museums Victoria, Tasmanian Museum and Art Gallery, NIWA (NZ), three Australian universities and Parks Australia. In turn, rising temperatures increase downpours and urban floods, adding to the pressures on urban infrastructure. Cairns is an expanding Queensland city located between two World Heritage sites – the Great Barrier Reef and the Daintree Rainforest. While important research focuses on these sites themselves, not much is known about how the surrounding urban areas influence these natural environments. Similarly, little is known about how urban planning and design contribute to the health of the inner city and surrounding water bodies, including the ocean. Cairns is a major Australian tourism destination with a unique coastal setting of rainforest and reef. This attracts growing numbers of visitors. One effect of this success is increased urbanisation to accommodate these tourists. lack of comprehensive assessment of the benefits of integrated urban design to maximise coastal resilience and the health of streams and oceans. Rain gardens are common in Singapore. As with most Australian cities, Cairns has an urban layout based on wide streets, mostly with little or no greenery. 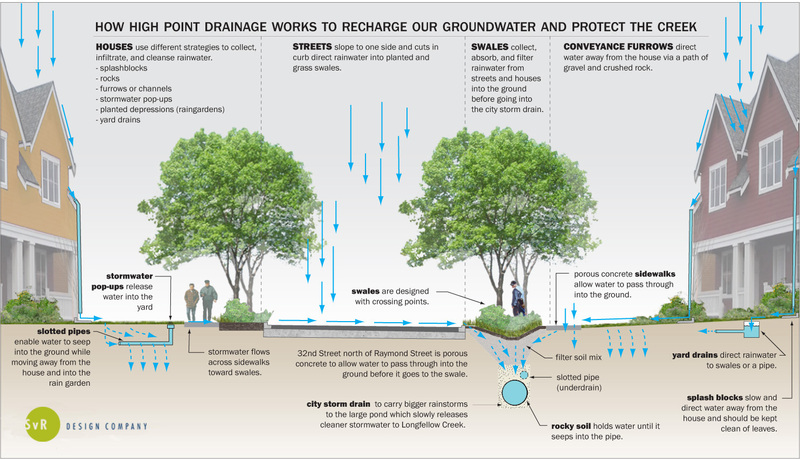 Rain gardens, for instance, are rare. Bioswales that slow and filter stormwater are present along highways, but seldom within the city. The arguments for not adding greenery to the urban environment are familiar. These typically relate to costs of implementation and maintenance, but also to the speed with which water is taken out of streets during the tropical rainy season. This is because green stormwater solutions, if not well planned, can slow down the water flow, thus increasing floods. However, cities can be designed in a way to imitate nature with solutions that are an integral part of the urban system. This can include dedicated areas of larger wetlands and parks, which capture water and filter pollution and undesired nutrients more efficiently, reducing polluted runoff to the reef. the blue – streams, stormwater systems, etc. A rain garden, which absorbs rain and stores water to help control run-off from impervious hard surfaces, in Wellington, New Zealand. Urban infrastructure, therefore, can and should be planned and designed to provide multiple services, including coastal resilience and healthier water streams and oceans. To achieve this, a neighbourhood or city-wide strategy needs to be implemented, instead of intermittent and ad hoc urban design solutions. Importantly, each element should coordinate with the others to avoid overlaps, gaps and pitfalls. This is what integrated urban design is about. So why don’t we implement it more often? Research has shown that planning, designing and creating climate-resilient cities that are energy-optimised, revitalise urban landscapes and restore and support ecosystem services is a major challenge at the planning scale. To generate an urban environment that promotes urban protection and resilience while minimising urbanisation impacts and restoring natural systems, we need to better anticipate the risks and have the means to take actions. In other words, it is a two-way system: well planned and designed green and blue infrastructures not only deliver better urbanised areas but will also protect the ocean from pollution. Additionally, it helps to manage future risks of severe weather. The uncertainties of green infrastructure capacity and costs of maintenance, combined with inflexible finance schemes, are obstacles to integrated urban solutions. Furthermore, the lack of inter- and transdisciplinary approaches results in disciplinary barriers in research and policymaking to long-term planning of the sort that generates urban green infrastructure and its desired outcomes. On the bright side, there is also strong evidence to suggest sound policy can help overcome these barriers through technical guides based on scientific research, standards and financial incentives. Collaborative partnerships are promising, too. Partnerships between academia and industry tend to be more powerful than streamlined industry project developments. Finally, and very promisingly, Australia has its own successful green infrastructure examples. Melbourne’s urban forest strategy has been internationally acclaimed. Examples like these provide valuable insights into local green infrastructure governance. Cairns has stepped up with some stunning blue infrastructure on the Esplanade which raises awareness of both locals and visitors about the protection of our oceans. This is only the start. Together academics, local authorities, industry stakeholders and communities can lead the way to resilient cities and healthier oceans. Cairns Esplanade Lagoon helps raise awareness of the need to protect the ocean as the city grows. Silent Evolution by Jason deCaires Taylor. Taylor makes sculptures and sinks them beneath the sea to create artificial reefs. Coral reefs around the world are in crisis. Under pressure from climate change, overfishing, pollution, introduced species and apathy, coral colonies and fish communities are steadily deteriorating. Coral cover in the Great Barrier reef has declined by an alarming 50% since the 1980s. Some leading scientists believe that the Great Barrier Reef is at a terminal stage. One way to address this is through reef restoration. At its simplest, this involves the addition of coral or habitat to a reef. It’s generally undertaken on existing coral reefs, but can also be done on rocky reefs or bare sand. We have looked back through the decades to celebrate the history of reef restoration, not just in science but also in art, business and politics. Gardener, by Jason deCaires Taylor. Just as there is no magic solution in human healthcare, there is likewise no magic solution in caring for corals. You do what you can with the resources you have. Some scientists have argued that reef restoration is a Band-Aid for the enormous problems that reefs face. We can agree with this point of view, but there are times when a band aid is very useful – and may prevent much more serious injuries. Reef restoration makes an important local difference, as seen here at Koh Tao, Thailand. Earlier this year the federal government allotted an unprecedented A$500 million dollars to the Great Barrier Reef. This included A$100 million focused on restoration to improve the health of the reef. Reef restoration science and projects complement community efforts. There is an increasing focus on addressing local issues such as water quality, overfishing, and outbreaks of crown-of-thorns starfish. When scientists, industry and government work with local communities we can accelerate the recovery of local reefs. To do this, we need people who want to make a difference. Once we recognise a degraded ecosystem, we work to reduce stress (like pollution in the water) and add new habitat or helpful species. 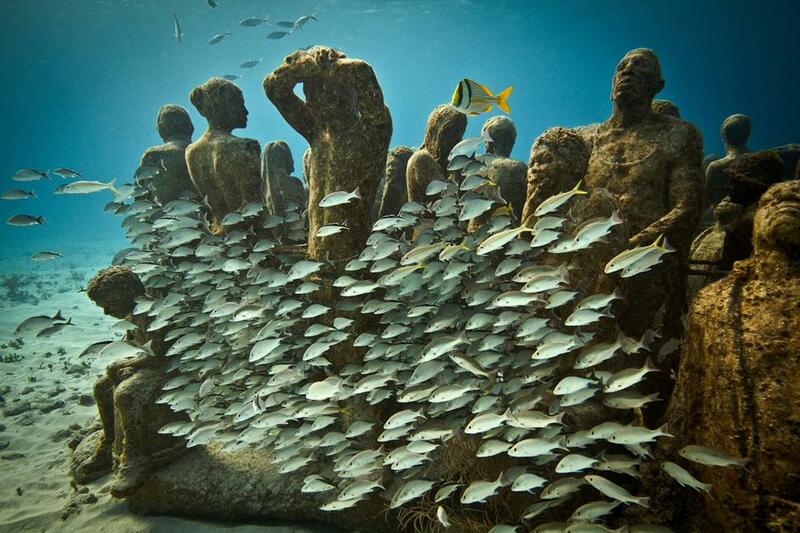 Artist Jason deCaires Taylor builds breathtaking underwater sculptures that double as artificial coral reefs. People have been restoring ecosystems and degraded land for thousands of years. Reef restoration, on the other hand, is relatively new and rarely documented. Our research indicates that in the modern era there have been three major waves of reef restoration. The first wave started in the 1970s and ‘80s, as scientists were able to easily SCUBA dive and new protective legislation was introduced around the world. This largely involved the addition of new habitats. These could be coral transplants, or artificial constructs likes shipwrecks, concrete pipes, tyres and a purpose built structure called a reef ball. The second wave from 2000-2010 was associated with scientists and conservationists responding to local concerns from cyclone damage, overfishing, introduced species and over-crowding at tourism sites, particularly in the Caribbean. Restoration methods at this point expanded to removing items as well as adding them, including algae, crown-of-thorns and lionfish. Reef restoration has evolved over decades. The third wave, from 2016, has focused on new scientific technology such as micro-fragmentation: breaking coral into small pieces so it grows faster. It also emphasises partnerships between government-business-community to reduce threats and restore reefs. This era also sees a huge increase in communication. Increasingly, we are influenced by social sciences and marketing rather than science and biology in our search for coral reef solutions. Organisations such as Rare, Citizens of the GBR and Reef Check are using citizen scientists, campaigns and pledges to reduce human impact and improve reefs’ health. As an example, the rapid phase out of plastic bags has been led by social media – not science. Documenting the history of reef restoration is important because it allows us to understand our past and be more informed and inspired to take action in the future. Sculpture at the Underwater Museum at Lanzarote Rubicon. The great men and women in our history were innovators who responded to crisis and went against convention by restoring reefs. We reviewed academic literature and conducted a global survey to find the pioneers who led reef restoration science, management, business and communication. These include Drs Austin Bowden-Kerby, David Vaughan, Todd Barber, Barach Rinkievich and Kristen Marhaver. An idea without action is just a dream. Similarly, an idea that has not been communicated widely and is not known and adopted by the general community cannot result in changed behaviour. Increasingly we recognise that good science and management is not enough without community support and action. The authors would like to acknowledge the valuable contribution of Nathan Cook, Senior Marine Scientist at Reef Ecologic, to this article. A presentation on the history of Reef Restoration will occur at the Great Barrier Reef Restoration Symposium, July 16-19, Cairns. Thanks to Jason deCaires Taylor for the use of images. See more at underwatersculpture.com. This article was updated on July 25 to clarify the location of the reef pictured demonstrating the impact of restoration.